Sometimes it’s the grammar or punctuation on a sign that has me scratching my head. This time, it’s the context: A block-long construction project with nary a tree in sight. Look closer, and all you see is a giant excavated pit. 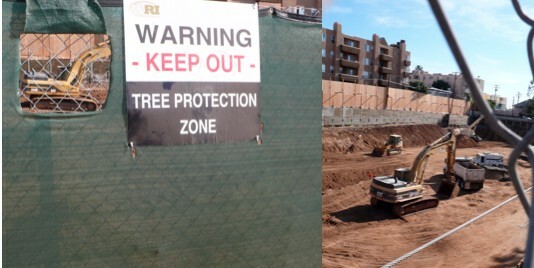 Turns out, a Tree Protection Zone is designed to ensure construction doesn’t disturb trees surrounding the area, as well as any root systems that might branch into the site. This entry was posted in Photo Blog by Vickie Bates. Bookmark the permalink.